Note: Last chance to sign up for The MicroCap Conference in Philadelphia on October 24 and 25. It’s a great place to network and hear from some interesting small companies. Sign up here. If you’re going, please let me know. I’d like to meet you. Alerus Financial is one of my favorite little financial services firms. Despite being a bank, the majority of Alerus’ value actually derives from its non-banking segments like retirement plan administration, wealth management and mortgage origination. Alerus is one of the nation’s fastest-growing retirement plan administrators. The market did eventually catch on and Alerus’ shares rallied nearly 90% in the 2 years following my write-up. However, shares now trade more than 20% off the highs reached one year ago. What gives? In short, Alerus’ value proposition is once again obscured. Earnings per share have declined as a result of significant one-time expenses related to acquisitions, high on-going expenses related to amortization of intangibles, elevated personnel expenses due to hiring for growth, and declining contribution from the mortgage unit. Reported EPS has declined to $0.92 per share for the twelve trailing months, after peaking at $1.46 per share in 2013. Not too many companies are going to see stock appreciation in the face of a 37% decrease in reported earnings. The addition of $350 million in banking assets via the acquisition of Beacon Bank in Minnesota. The acquisition, which saw Alerus expand into the Duluth market, closed in January. A full year’s earnings contribution from Beacon Bank is not yet reflected in Alerus’ results, but one-time costs associated with the acquisition are. Additionally, the acquisition created an amortizable deposit premium asset which has reduced Alerus’ earnings, but not its cash flows. The acquisition of Alliance Benefit Group North Central States, a retirement plan administration overseeing accounts for over 75,000 participants and $6 billion in plan assets. The purchase also closed in January, creating one-time expenses and an amortizable asset. For the second quarter of 2016, Alerus reported net income of $2.94 million and EPS of $0.21. Let’s take a crack at normalizing this figure. In the quarter, Alerus recorded $2.1 million in one-time costs related to conversion and integration expenses for the newly-acquired Beacon and Alliance assets. Alerus also recorded $414,000 in one-time expenses related to extinguishing FHLB borrowings. Most interestingly, Alerus recorded $1.78 million in intangible amortization expense for the quarter. This expense is intended to represent the declining value of acquired bank deposits from Beacon Bank and customer lists at Alliance Benefit Group North Central States. This expense has no cash impact on Alerus beyond reducing its taxable income, yet intangible amortization has become a very meaningful income statement item for Alerus as it continues to be an enthusiastic acquirer. The increasing levels of amortization have had a seriously negative impact on reported earnings without impacting cash flow. 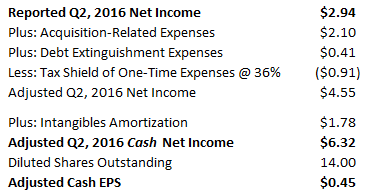 Here is a look at Q2 earnings with the one-time expenses and non-cash charges stripped out. Alerus’ tax expense has hovered around 36% of pre-tax income for some time, so I am using that to estimate the tax shield from one-time expenses. After adjusting for the acquisition-related and debt extinguishment expenses, Alerus’ net income look substantially better at $4.5 million, 55% higher than the reported figure. Things get even better when we adjust for the substantial non-cash amortization expense. Alerus’ adjusted cash EPS is more than twice the reported figure at $0.45 for the second quarter. I wish computing Alerus’ P/E ratio were as easy as annualizing this adjusted Q2 figure, but it is not so. 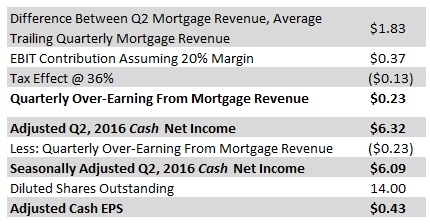 While the company’s banking, retirement plan administration and wealth management segments show minimal seasonality, the mortgage origination unit performs substantially better in the second and third quarters. We can compensate for this factor by adjusting Alerus’ Q2 mortgage income down to the average figure for the twelve trailing months, which happens to be $6.26 million. We’ll also have to make an assumption on the segment’s operating margin. I think 20% is appropriate, given that Alerus as a whole has an efficiency ratio of around 80%. Annualizing that figure yields estimated forward cash EPS of $1.74 without assuming any growth. Looks like Alerus’ earning power has continued to increase, only now it is being disguised by the rising non-cash amortization expenses and transactions costs. On today’s price of $16.60 or so, Alerus is trading at a normalized forward P/E of 9.5. In my opinion, this is far too cheap a price for a company with a history of strong growth in its non-bank operations, and stability and profitability in its banking segment. It is possible that income from mortgage operations will decline further in the face of rising interest rates, but I believe the current valuation more than compensates investors for this possibility. Alluvial Capital Management, LLC is launching a private investment partnership. If you are an accredited investor and are interested in learning more, please contact us at info@alluvialcapital.com. Alluvial Capital Management, LLC holds shares of Alerus Financial for client accounts. Alluvial may buy or sell shares of Alerus Financial at any time. If we adjust out the amortization then shouldn’t we add back the cost of re-acquiring 75,000 customers (or however many we expect to lost over the amortization period)? Great idea though, very interesting. We certainly should, but only if the acquired customer lists truly are a wasting asset. Historically, that has not been the case and Alerus’ accounts and assets under administration tend to grow organically, with additions outpacing lost accounts without any particular effort by Alerus. But since accounting rules permit recognizing customer lists as an amortizable asset, it is tremendously favorable for Alerus to do so and to enjoy the tax break. Hi David, just wondering, how long does it usually take you to analyze a company? It takes me at least a week to read and think through a company’s reports and I find it rather inefficient/the price got away from me by the time I finish my analysis. What’s some of your advice on improving efficiency? Also how do you keep track on so many stocks? Thank you! Is there a way to find out the shareholding of the company ? I am mainly interested in how much do the insiders hold. Yes, if I were calculating normalized EPS, that would be the way to do it. But I was calculating cash earnings per share, so the entire amount of the intangible amortization is available. I like that they are making more of an effort to highlight their results. I wish they would uplist!